Ryan Donohue is a rising American cellist who was recently appointed as the 14th fellow of the prestigious Montgomery Symphony Cello Fellowship. 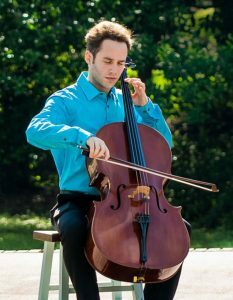 Ryan received his bachelor’s degree in cello performance from the University of Cincinnati: College-Conservatory of Music (CCM), where he studied with Alan Rafferty. He has performed across the United States, Japan, and Europe in orchestral, solo, and chamber music settings in renowned music festivals, such as the Pacific Music Festival, the Kent/Blossom Music Festival – a partnership with the Cleveland Orchestra – and the Green Mountain Chamber Music Festival. Ryan has played with the Blue Ash/Montgomery Symphony since early 2017. A native of Cincinnati, Ohio, Mr. Donohue was born into a music family; his mother is a professional violist. He began his musical studies at the young age of three, but did not begin studying the cello until four years of age, after a brief time studying violin. In his early years, he was taught cello using the widely-acclaimed Suzuki Method of teaching under the tutelage of Nadine Monchecourt, and later Thomas Guth. Beginning in high school, Ryan attended Cincinnati’s famous School for Creative and Performing Arts School (SCPA), the first K-12 art school in the country. At SCPA, he had the privilege of working with members of the Cincinnati Symphony Orchestra, and was exposed to master classes with musicians from a wide variety of genres, spanning from Branford Marsalis to Gil Shaham. During his time at CCM, he played in master classes for Hans Jørgen Jensen, Mark Kosower, Merry Peckham, Michael Block, Matt Haimovitz, and Robert Nagy. Ryan is an advocate for both new music and music composed by American composers, as well as pieces by well-known composers that are not often performed. Cincinnati Symphony-commissioned composer Brian Nabors, an Alabama native, dedicated to his Sonata for Cello and Piano (2017) to Ryan, and he is excited to share this piece during his time in Alabama.